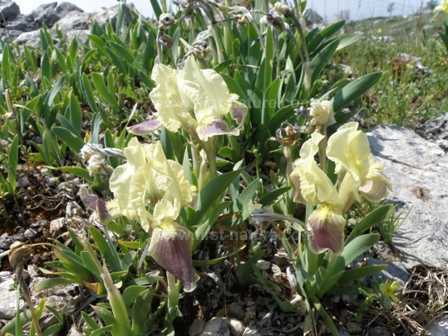 Above: Rocky outcrops and open short grasslands are the places to look for this lovely iris. This is a very short iris species which has very large flowers which are often 6 - 8cm across. The sword-shaped leaves of Iris pseudopumila are barely curved, and the flowers are usually bi-coloured - as above. This lovely flower blooms during April and May. It occurs in Southern Italy, Malta, and also in some Central European countries. The best place to look for it are on rocky outcrops, in short grassland in hilly or moutainous regions. The plants shown on this page were photographed in Italy on the Gargano Peninsula in April.